Texas Metal Buildings designs Quality Steel Buildings, we are your source for Pre Engineered, Prefabricated Metal Buildings in Texas, Steel Building Kits, Commercial Mini Storage, Boat and RV Storage Buildings, Business Parks, Industrial Parks, general Steel Building Components, Metal Building Accessories. For large or small projects throughout Texas the U.S. Canada and Mexico. Design, supply and delivery of superior, Competitively priced Steel Buildings, Standard or Custom, all will be designed for your site and to fit your needs, all frame buildings will meet the rigid AISC Standards. Get a Fast and Free Quote today. Nominal sizes range from widths of 20' to 165' clear span (up to 300' Clearspan available) and 10' to 40' eave height, symmetrical or offset gables. lean-tos and single slope designs..
Our line of Commercial Mini-Storage and Self Storage buildings come complete with everything that you need to complete your, Mini, Self, Boat or RV Storage Building, let our unsurpassed customer service, and our network of Contractors make your business dream a reality. Price a Mini Storage today. All Mini and Self Storage Buildings will meet SGSI Standards. We Serve the Business Sector, Farmers, Ranchers and the Professional Contractor / Erector or those that want to build it themselves (Or through our network we will help you find an Erector or General Contractor in your area). We supply Metal Buildings for Industrial, Residential, Commercial, Oil Field, Retail, General Aviation, Government, Petro Chemical, Energy, Agriculture, Public and Private Utilities all in strict accordance with the AISC or LGSI and your specifications. 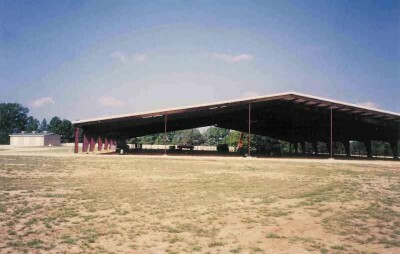 Texas Metal Buildings offers a full line of rugged Steel Buildings for Agricultural, Industrial, Commercial or Residential applications, we have Clear Span Riding Arenas, Horse Barns, Roof only structures, Hay Barns and Equipment sheds. A Texas Metal Building can be erected on a concrete slab or on piers and can be custom designed to meet all of your storage and equipment protection needs. Homeowners, Farmers and Ranchers can protect their vehicles, equipment, tools and work your cattle and horses in comfort and safety. We design with your needs in mind, surpassing traditional construction methods with benefits that include initial cost savings, pre-planning for your needs, simple erection, a Texas Steel Building is Superior and Insurance friendly and a Texas Metal Building with our optional Galvanized Primary and Secondary Structure will require much less to no maintenance, will result in an Environmentally Responsible building that will last even in the harshest of Environments. "Texas Metal Buildings Assembly and Safety Manual" we encourage all prospective customers to download the manual and be familiar with basic and general steel erection practices and procedures. It is a large file but it is free and upon your purchase of a Pre-Engineered Steel Building from Texas Metal Buildings we will send you a hard copy manual and your “Pre-Engineered Drawings”. Texas Metal Buildings provides high quality, pre-engineered metal buildings. For your new building to yield optimum integrity and durability, proper assembly is required. The "Texas Metal Buildings Assembly and Safety Manual" provides detailed and general steel assembly instructions, and is intended to be an aid to your Pre-Engineered Drawings, which dictate specific building parts and construction details. Prior to construction, it is recommended that you read the "Texas Metal Buildings Assembly and Safety Manual" and thoroughly study the provided “Pre-Engineered Drawings”. Understanding the assembly process of the pre-fabricated steel building allows the erector to properly plan the assembly for a Superior end product and help avoid unnecessary delays. The availability of any required general utilities should also be considered at this time. 1. It is recommended that the foundation be designed by an experienced foundation engineer and coordinated with all local city, county and state codes. Design, supply and delivery of high quality, Eco Friendly, Competitively priced Superior Metal Building, Standard or Custom, all will be designed for your site and to fit your needs, all frame buildings will meet the rigid AISC Standards. All Mini and Self Storage Buildings will meet SGSI Standards. Supplying General Steel Building Design, Engineering and Supply for City, State, Military, National, Private, Disaster Relief, Oil Exploration, Mining, Farming, Ranching, Tourist, Aviation, Public Sector Entities. We believe that building with Steel is a Superior Cost Effective and Eco Friendly Building System. We want our Customers to know that a Steel Building System is a Safe, High Quality, Environmentally Safe alternative building solution. Homeowners, Farmers and Ranchers can protect their vehicles, equipment, tools and work your cattle and horses in comfort and safety. We design with your needs in mind, surpassing traditional construction methods with benefits that include initial cost savings, pre-planning for your needs, simple erection, a Steel Building is Insurance friendly and a Texas Metal Building with our optional Galvanized Primary and Secondary Structure will require much less to no maintenance, will result in a Superior Environmentally Responsible Steel building that will last even in the harshest of Environments.